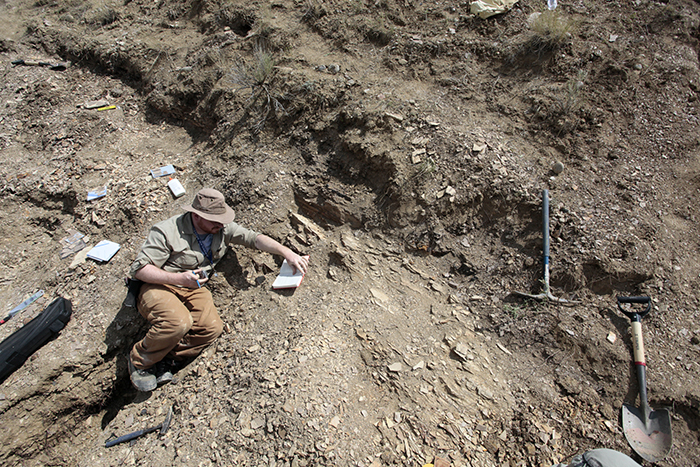 University of Illinois entomologist and paleontologist Sam Heads and his team are in the Ruby Valley of southwest Montana to hunt for fossils from the Oligocene epoch, some 23 million to 33 million years ago. Sam Heads examines the stratigraphy (rock and sediment layers) in an excavation trench. Standing at the foot of the mountains, I look to the east. It’s still early and I have hiked up here alone to gather my thoughts. I can see why they call this “Big Sky Country.” The tree-covered foothills of the mountains behind me give way to rolling scrubland. Stunted trees mark the edges of dry creek beds cut into the soft rocks below. This is southwest Montana, and I’m here to hunt. The team is searching for fossils in southwest Montana. The Ruby Valley of Madison County, Montana, is home to all kinds of large and impressive animals – from pronghorns and moose to grizzly bears – but I’m not hunting big game. 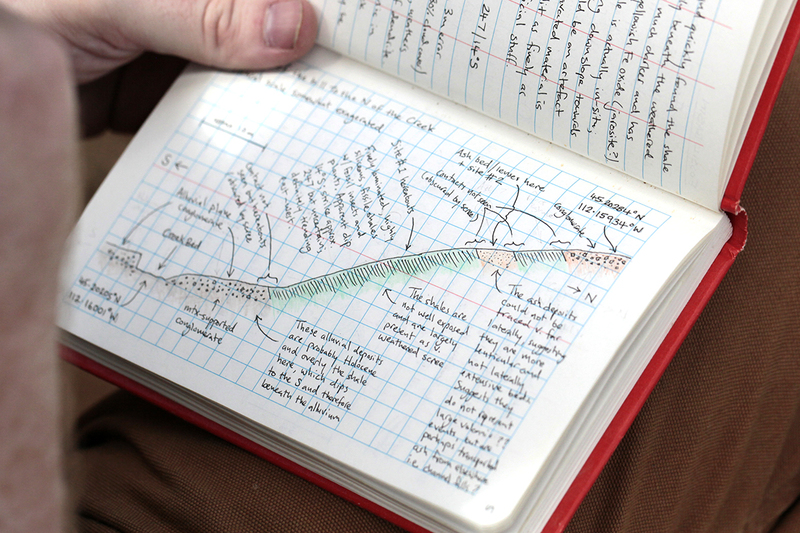 As a paleontologist, I’m here to hunt fossils, and this place is a fossil hunter’s paradise. The finely laminated shale beneath my feet is all that remains of an ancient lake that dominated this area during the Oligocene, some 23 million to 33 million years ago. Thin layers of clay and volcanic ash preserved beautifully the remains of insects and plants, providing a glimpse of an ancient ecosystem. This remarkable fossil deposit has drawn me and my team here to explore a world long since lost to deep time. 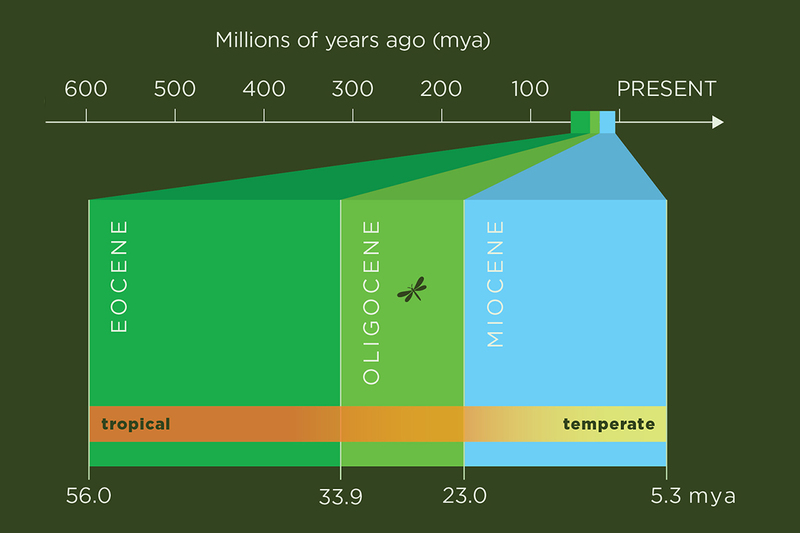 The Oligocene was a dynamic time in Earth’s history, characterized by sweeping changes in global climate and ecology. It witnessed a major transition from the lush, tropical world of the Eocene to the more modern-looking ecosystems of the Miocene, seeing the retreat of tropical forests toward the equator and the expansion of open grasslands. 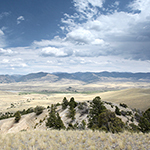 The Oligocene epoch was a time of gradual transition from a tropical to a temperate climate in southwest Montana. In western North America, this occurred in the wake of an episode of mountain building that lasted about 30 million years and gave rise to the Rocky Mountains. Then a period of crustal extension led to the formation of fault-bounded basins east of the Rockies in which lake systems developed, depositing thick layers of sediment dominated by clays, muds and volcanic ash. 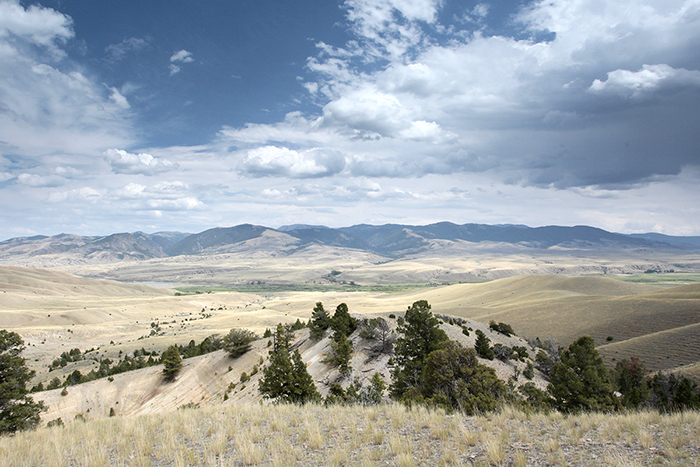 A view of the Fossil Basin in southwest Montana. 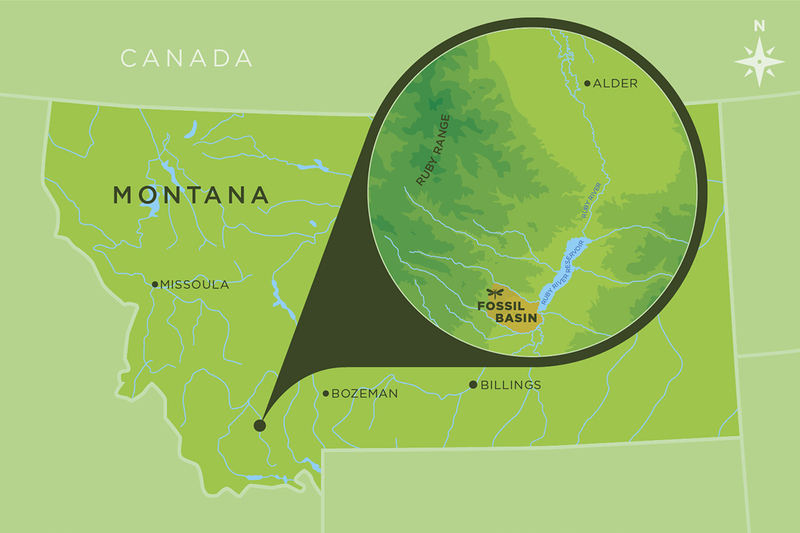 One such package of sediments – the Renova Formation – is exposed immediately west of the Ruby Reservoir, several miles south of the small community of Alder, in the aptly named Fossil Basin. This is where we will focus our efforts, picking up where we left off last year and opening new excavations at promising new localities. I can see my team far in the basin below me, beginning the first day’s work. When I left them for my solitary hike, they were busy unloading equipment – hammers, pickaxes and shovels, the tools of our trade. Their excitement was palpable, with discussion filling the air and anticipation written on every face. We’re all eager to start digging. 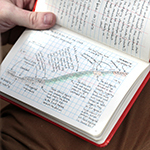 A page from Sam Heads notebook. As I make my way back down into the basin, I’m reminded of the motto of the Paleontological Society – frango ut patefaciam, “I break in order to reveal” – and wonder what ancient fossil treasures this year’s excavations will unveil. Sam Heads is an entomologist and paleontologist with the Illinois Natural History Survey, part of the Prairie Research Institute at the University of Illinois. He can be reached at swheads@illinois.edu.